An example demonstrating communication through Bluetooth QML API. Bluetooth QML Chat example shows how to use the Qt Bluetooth QML API to communicate with another application on a remote device using Bluetooth. 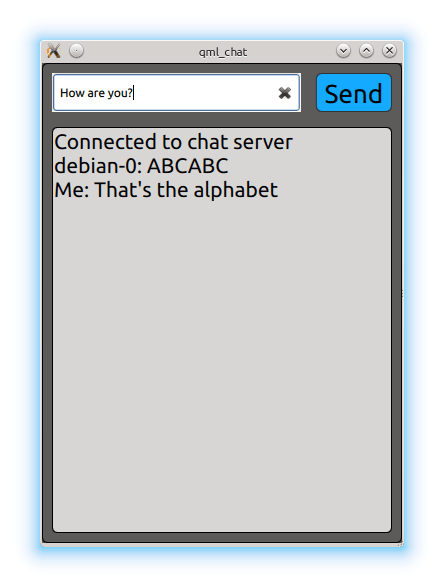 The Bluetooth QML Chat example implements a simple chat program between two parties. The application acts as client and attempts to connect to a Bluetooth socket server. It uses the BluetoothDiscoveryModel type to find the server and BluetoothSocket type to facilitate the data exchange. The example only works in connection with the Bluetooth Chat Example. The Bluetooth Chat example launches the chat service and advertises it via the Bluetooth SDP protocol. It is important that the device running the Bluetooth Chat example actively advertises its SDP services. This can be checked using the QBluetoothLocalDevice::hostMode property. The uuidFilter property is used to only search for the chat server UUID and the running property activates the search. Once a service with a matching UUID is found the model emits the serviceDiscovered(BluetoothService) signal. The BluetoothService type encapsulates the details of the found chat server, such as the name and description of the service, as well as the name and address of the Bluetooth device offering the chat server. It is passed to the BluetoothSocket to establish the connection.